It can affect anyone. A variety of foot problems can lead to adult acquired flatfoot deformity (AAFD), a condition that results in a fallen arch with the foot pointed outward. Most people, no matter what the cause of their flatfoot can be helped with orthotics and braces. In patients who have tried orthotics and braces without any relief, surgery can be a very effective way to help with the pain and deformity. One of the more common signs of flatfoot is the "too many toes" sign. You can see from the photo above, even the big toe can be seen from the back of this patient's foot. In a normal foot, only the fourth and fifth toes should be visible. Damage to the posterior tibial tendon is the most common cause of AAFD. The posterior tibial tendon is one of the most important tendons of the leg. It starts at a muscle in the calf, travels down the inside of the lower leg and attaches to the bones on the inside of the foot. 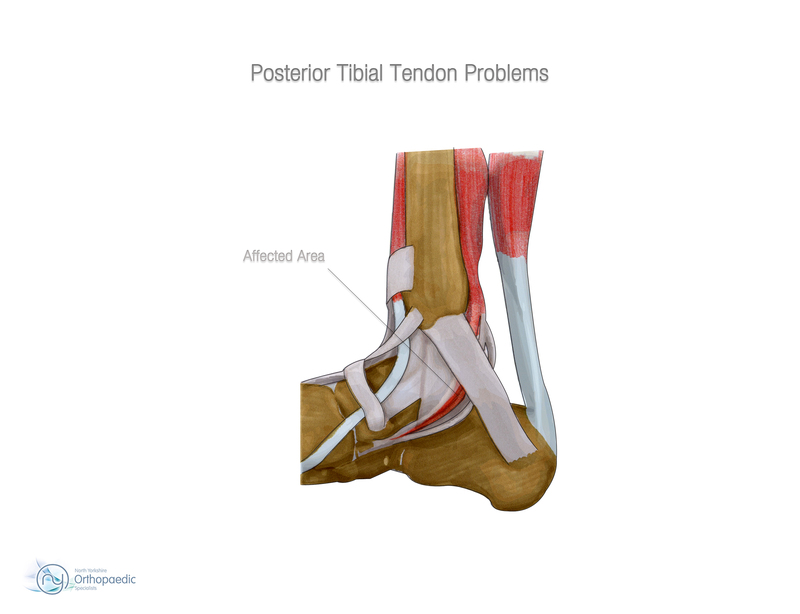 The main function of this tendon is to hold up the arch and support your foot when you walk. If the tendon becomes inflamed or torn, the arch will slowly collapse. People with diabetes or with a nerve problem that limits normal feeling in the feet, can have arch collapse. This type of arch collapse is typically more severe than that seen in patients with normal feeling in their feet. This is because patients do not feel pain as the arch collapses. In addition to the ligaments not holding the bones in place, the bones themselves can sometimes fracture and disintegrate, without the patient feeling any pain. This may result in a severely deformed foot that is very challenging to correct with surgery. Adult acquired flatfoot is one of the most common problems affecting the foot and ankle and can arise from several causes. Treatment ranges from nonsurgical methods such as orthotics and braces to surgery. It is important for diagnosis and treatment to be undertaken by a foot Specialist, who has the experience to advise on such matters.